Around a year ago I wrote about how a new augmented reality technology (called Magic Symbol) was offering the chance to fuse the real world and virtual world to create interesting / engaging experiences. Augmented reality is based around holding a 2D image up to a webcam and then seeing a 3D image on screen. This augmented reality technology is now being adopted by advertisers and there have been some interesting uses of augmented reality recently. Nokia and Verizon have partnered around the new Star Trek film and have created a series of interesting experiences for online users at www.joinstarfleetacademy.com. 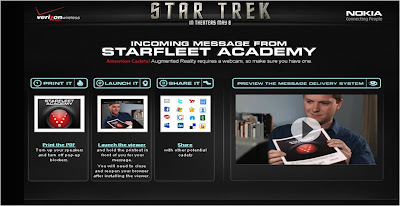 One of the most engaging is the chance to use augmented reality to get a 'message from Starfleet' - users print off a pdf, hold it up to their webcam and get an exclusive message that they can then share through social sites. 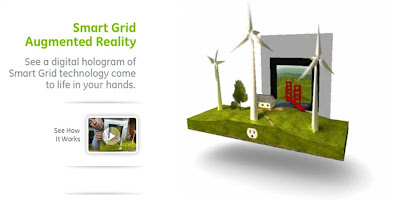 GE have been using augmented reality to allow users to see 'a digital hologram of Smart Grid technology come to life in your hands.' Under the slogan ecomagination, the augmented reality piece really brings the concept to life. In Germany Mini used augmented reality to launch the Mini Cabrio (NB: have to use Internet Explorer to open.) 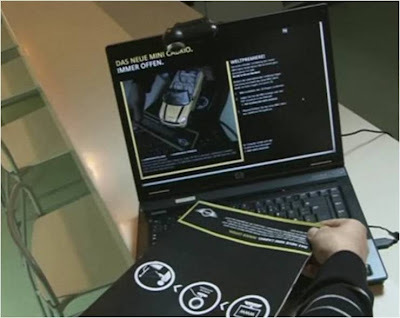 Prominent full page ads in German motoring magazines acted as a base for the Mini Cabrio augmented reality experience. If readers held the ad up to a web cam, they then got to play with a 3D Mini on screen. Whilst augmented reality has a novelty factor around it at the moment, it does demonstrate how offline and online media can work together to create an experience. Changing a static 2D image into a virtual 3D image is a really interesting way of re-interpreting print and as functionality evolves it could be a powerful opportunity (particularly for publishers) to really integrate print and digital. Kris Abel has some other great examples of augmented reality here and I'm sure we'll be seeing more of this! Interesting to see how many car manufacturers had a go at this augmented reality technology actually.